State of the art medical diagnostic and treatment centre in central Manchester. Brighouse are proud to have been involved in the custom design and build contract of The Bridgewater Hospital on Princess Road, Manchester. The hospital was designed as a ‘centre of excellence’ for diagnostic screening, therapeutic, interventional, endoscopic and IVF fertility work. Bridgewater Hospital was completed by the team on time and handed over following the Health Care Commission sign off on their first visit. 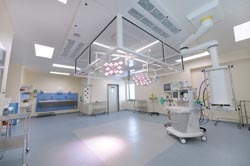 Internal works included three bespoke theatres, impressive MRI, ultrasound, X-ray, consulting and office rooms.